Google has recently introduced "What's Popular," a gadget for user iGoogle startup pages. The gadget will display popular items of interest in the form of links with titles and short descriptions from Google's index on users' iGoogle pages. Users can then vote up or down results to alter the results. On the surface, it's like Digg, but there are some important differences. No login, username or special account is needed to vote, other than already being signed into your iGoogle account. Like Digg, you can submit URLs for inclusion in the gadget. Unlike Digg, you don't need to provide any other information other than the URL. You can submit anonymously. This eliminates the worry of being penalized for submitting your own content. If you decide to submit using your Google ID, you can edit the title and description of the submission. Also unlike Digg, there presently is no area for commentary or the capacity to make friends. On the surface, it could be argued that this gadget has the potential to be a much more democratic process than a site like Digg, where results are regularly manipulated by networks of "friends." That's assuming Google is keeping tabs on multiple submissions and votes from the same sources. While Google is, of course, mum on the details of what makes a certain submission "popular," it's safe to assume there are a number of individual factors working as a whole. Google likely takes into account the number of links pointing to the submitted page, user votes (pops) on the gadget and number of times the URL has been submitted, among other factors. So, it would make sense that the more your URL is submitted and voted on, the better chance of landing in a good position on the gadget. 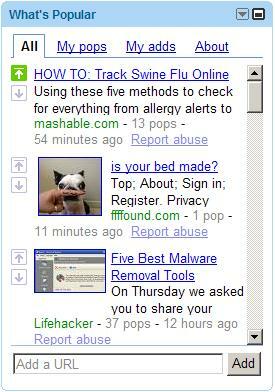 As you might expect, submissions look to be filtered by recency and relevancy, such as "HOW TO: Track Swine Flu Online" being at the top of the results all day, as of this writing. There are some bookmarking-type functions in the gadget, including "My pops" (those submissions you voted for), and "My adds" (your own submissions). Expand the gadget and you can filter results by Stories, Videos and Images, and choose between Date Added and Most Popular. Early looks show that most of the submissions come from tech-focused websites, such as Mashable, Lifehacker, CNet and ReadWriteWeb, as well as major news sources like Time and The New York Times. However, there are some offbeat submissions such as one from ffffound.com in the second position (see image). At any rate, this is a target for submitting your URL, like anything else Google. Reports from last year also show that personalization pages are gaining momentum with users, particularly iGoogle. Another interesting point to note is recent reports of iGoogle being responsible for 20 percent of Google homepage visits. You can expect this gadget to catch on with users. And, you can reasonably expect that Google will get more sophisticated with this tool as feedback starts rolling in from users. Click to add What's Popular to your iGoogle page.